Adhikara (studentship)...The 5 elements of student ship. Questions to contemplate on. How to cultivate in asana practice. Adhikara, is a Sanskrit word that translates to mean studentship. Adhikara can be applied to any aspect and any skill in your life…Yoga, piano, parenting…But I will be focusing on how to apply adhikara to your yoga practice. It is such a wonderful qualities to cultivate. The more you apply adhikara in your practice, the more you will see it spreading into every aspect of your life. 1. Sky: unbounded, beginners mind, soft, humble, “just try it” attitude. 2. Earth: solid, unwavering, grounded. 3. Water: fluid, receptive, accommodating. 4. Fire: burning, transformative energy, aspiring for greatness, reaching for excellence. 5. Air: dexterity of mind, flexible thinking, breath, not getting stuck. 1.Be open like the sky. Be humble. Instead of being stubborn, cultivate a “just try it” attitude. The sun is always shining somewhere in the sky so connect to your inner brightness! 2.Be steady like the earth. Find strength, dig deep. Total power. Have unwavering disciple on your path. 3.Be like the water. Be fluid. Be humble. Any obstacle that comes in your way you can deal with, your accommodating. Be accommodating with what the body needs when you are on your mat. Every vinyasa? Childs pose? 4.Be like the fire. Have passion. Reach for excellence. What drives you? What inspires you? What fuels your action? Aspire for greatness. Feel the transformative energy of the heart. 5.Be like the air. Always moving. Not get stuck in past assumptions. Feel the air in your breath. Be flexible in your mind. Apply the yoga teaching to your life! Tadasana: open, soften (sky). Hug muscular energy in, strength (earth). Inner thighs back, truck tail bone (water). As the tail bone scoops under feel the lift in belly, aspire for greatness, reach up from the heart, fingers spread (fire). Breathe (air). Uttanasana (forward fold) to Ardha Uttanasana(half way up forward fold): fold forward. Open to new possibilities (sky). Engage your thighs draw your shins toward each other (earth). Pelvis rotates forward over the thigh bones, like a waterfall as the spine lengthens toward the ground (water). Create length up the spine, like a candle flame (fire). Breath, keep moving and expanding (air). Plank (top of a push up): soften and open. This is a new pose, open to something new (sky). Finger pads push down firmly the chest lifts up. The balls of the feet press down and forward the thighs draw back. Strength and stability (earth). Tuck tail bone under, find fluidity in pelvis (water). Allow your passion to keep you in the pose. Want to do good (fire). Feel the breath ripple through the body (air). Chaturanga (four limbed staff): Soften your face and smile (sky). Bend your elbows to a 90 degree angle, don’t let your shoulders drop bellow your elbows. Belly stays strong, thighs stay back, press into the hands and toes (earth). Tuck tailbone, feel the gentle movement as you hover above the ground, accommodate this gentle pulsation (water). Find the passion and drive that keeps you holding chaturanga. You could hold chaturanga for so long because you have aspiration to do great. Be great (fire). Breathe, flexible mind (air). Bhujangasana (Cobra): let go of you knowing what this pose will be like, and open to something bigger (sky). Head and chest lift. Muscle energy, shoulders on the back body while maintaining length in the side body. Lift and open your heart. Press the tops of the feet down (earth). Tuck the tail bone get out of the low back and curl into the upper back (water) lift more with the heart, scope the tail bone more, press into the feet more, dig into yourself and find what inspires you in this pose (fire). Allow the breath to take you deeper (air). Adho Mukha Svanasana (Downward-Facing Dog): Open to new possibilities open to Grace. We do this pose frequently, can you let go of your past experiences and experience something new (sky). Press into finger pads, claw the ground. Arms bone draw onto back body, shines pull together (earth). Groins back and apart, melt heart (water). Find your inner flame, your passion and allow that passion to fuel this pose (fire). Feel the breath move through you (air). •Anjaneyasana (lunge): soften as you open to something new, something unbounded (sky). Start by bringing your hands to your thighs, draw your feet toward each other fire up the thighs. Strength, steadfast and unwavering (earth). Sit bones widen then, tuck the tail bone under creating freedom in pelvis (water). From the tucking of the tailbone feel the side bodies rise, from that lift extend. Reach from your kidneys, from your heart up to the finger tips. Reach to do great! Be great (fire). Breath softly with a gently smile that tickles your brain (air). •Parsvakonasana (side angle pose): Open, don’t think you know everything. What would happen if you have a totally new revolution in this pose (sky). Same arm on thigh other hand to other hip, full power hug in. Draw your feet together, thigh bones engaged. Shoulders drawn away from the ears keeping the side body bight and long (earth). Widen the sit bones apart, and then inner spiral back leg. Externally rotate the front leg, tuck tail bone forward and toward the front heel. More space in the pelvis (water). Maintaining the length in side body reach hand on hip over head palm face down. Inner body bright. Allow your inner sweetness to shine out through the pours in your skin. This shinning out is your passion (fire). Breath (air). • Do you have a beginner's mind? • Are you opened to grace? • Are you stubborn or are you open to new possibilities? • Do you have a steady yoga practice with devotion? • Have you dedicated yourself to yoga, meditation, and pranayama? • Do you practice regularly? • Do you ride the waves of life? • Do you go with the flow? • Do you have aspiration in life? • Do you have fire and desire? • Do you want to exceed? • Do you want to aspire to your greatness? • Are you able to flow with the winds of change? • Do you have flexibility of mind? • Can you apply the teaching from one pose to another? The Yoga Sutras, written by Patanjali was the first book to outline the art and science of yoga, explaining how to reach enlightenment (Samadhi). These sutras serve as a map for the inner journey, helping to develop every level of our being and enhancing every aspect of our life. Patanjali divided the 196 sutras into different four chapters (pada) that comprise what is often called Classical Yoga. In this sutra, Patanjali explains that every yoga posture needs to be balanced with qualities of Sthira (steady, stable, effort, steadfast) and qualities of Sukham(ease, delight, and joy). It is by practicing both of these extremes, between effort and ease that we find balance in the middle. It is like a singing crystal bowl. As you make the bowl sing, the sound expands out more and more, between sound and silence, and high and low, but within these extremes the physical bowl is vibrating in the center. By performing our yoga postures with qualities of Sthira and Sukham, we find ourselves ‘vibrating’ in the center, in our heart! We find a balance between firmness and softness, tension and relaxation, effort and ease, muscle and flexibility, which offers a delicious luxurious challenge. Patanjali says that the combination of Sthira and Sukham creates a state of equilibrium (satva) that is without agitation (rajas) or inertia (tamas). Depending on our personality type will determine which aspect of Sthira and Sukham we need to work on more. If we naturally find our self full of effort, strength and steadfastness we need to work on softening and experiencing the delight in our poses. If we are more lethargic we need to push ourselves harder. So the next time you are practicing and your body is trembling with effort (or jumping with joy) can you soften slightly and connect to a place within you that is at ease, and find the delight within the effort? The next time you are practicing and you feel too at ease with no sense of strength in your pose can you dig a little deeper and look the tiger in the eye a little bit more finding the quality of steadfastness that Patanjali refers to? I think Sthira and Sukham is also great to practice off the mat. When life seems hard, or a situation comes up that feels full of effort, can we look into the situation and find the joy? When we are lazy can we find the strength and effort to get off the couch? The Yoga Sutras of Patanjali states that "Jalandara bandha catches the flow of nectar in the throat". This is a very fun, sweet practice that opens the chest, softens the throat, and allows the pallet of the mouth to be luminous. While practicing Jalandara bhanda keep the pallet of the mouth open, stay soft in the throat, and experience the heart radiant. On the inhale the lower back slides up the spine towards the head. 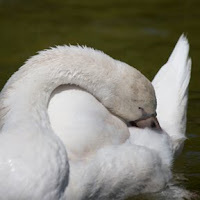 And as you exhale feel the low back gently soften down toward the tailbone. Benefits: Practicing Jalandara bhanda opens both the front and the back halves of the diaphragm, balancences the pelvic floor, balances the activities of the brain.It opens the physical and energetic channels of the back and neck, while compressing the channels in the front of the throat. It causes prana (life force energy) to collect in the throat, and when the bandha is released the energy flows into the skull. Jalandhara bandha also controls the body's metabolism, by applying pressure to the thyroid, which secretes the hormone thyroxin. This hormone is responsible for the rate of tissue metabolism; it also activates enzymes and oxidation in cells. "Massaging" the thyroid by using Jalandhara bandha helps regulate this organ and keeps it in good health. Yoga has both preventative and therapeutic benefits. Yoga asanas (postures) stretch, extend, flex, and exercise the muscles and the joints. When done in addition with pranayama (breathing techniques), yoga stimulates circulation, digestion, and the nervous and endocrine systems. Once upon a time in the celestial realms lived a young man, Lord Shiva, and a young woman, Sati (also thought of as Shakti). 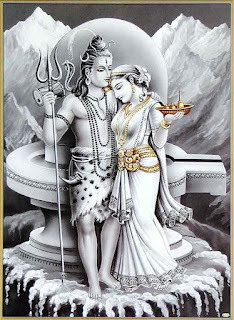 Shiva and Sati fell madly in love and were wed. Unfortunately their story did not end here. For Sati was the daughter of King Daksha, who never approved of his daughter marrying a dreaded hair yogi who danced, sang, and consumed intoxicants. To show his disapproval, Daksha through a huge party, inviting everyone in the universe except for Shiva and Sati. Sati heard about the lavish party that her father was throwing to punish her and Lord Shiva. Annoyed, she begged Shiva to go with her to the party in spite of her father’s wishes. As the wise Lord of Consciousness Shiva replied; “why go, were we are not invited?” Sati disagreed and decided to go alone. When she arrived her father jokingly announced that she must have come to her senses and left her husband. Sati whom was not amused defended Shiva, even pointing out his divineness, his oneness with nature, and his supreme consciousness. She realized her father would never understand so she announced “since you have given me this body I no longer wish to be associated with it!” Determined she took her seat on the floor in the middle of the party and closed her eyes. She visualized Shiva and then through pranayama (breathing techniques) and other yogic exercises she cultivated her Agni (internal fire). Moments later she burst into flames, leaving the body her father had given her. Out of devastation and grief of Sati’s fiery death, Shiva enraged tore out his hair (or a dread lock depending on which ancient text) and from this hair he created the fiercest warrior, which he named Virabhadra. Vira is the Sanskrit word meaning hero and bhadra means friend. 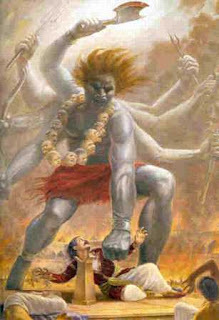 Shiva instructed Virabhadra to go to the party and seek revenge for Sati’s death. Virabadhrasana 1: Virabhadra entered the party by breaking through the ground as he rose from within the earth clasping a sword in each hand. Virabadhrasana 2: Moments later he spotted Darksha from across the room. Shiva quickly came to the party to see what Virabhadra had accomplished. When he arrived he was heartbroken, his rage turned to sadness followed by compassion. He searched for Daksha, finding only his body. Filled with remorse Shiva found a goats head and placed it on Darksha’s headless body bringing his father-in-law back to life. After Darksha awakens, he recognized Shiva’s kindness and bows. Shiva walked away to be alone and remember his love Sati. Remembering that Lord Shiva represents the Higher Self, Sati (Shakti) represents the heart and Daksha represents the ego we can interpret the story to mean that the Higher Self destroys the ego for the sake of the heart. Through compassion the higher self forgives the ego but still withdrawals to remember the essence of the heart. So...as we practice our warrior poses can we remember that we are destorying the ego! Whata does yoga teach you? 1. alignment and breath = clear mind: In yoga we learn to focus our awareness on our alignment, and breath to help steady our mind. We learn to listen to our body, making little adjustments so our asanas (yoga postures) embodies and shines out our love. We learn different breathing techniques to help fine tune our awareness, keeping our mind in the present wonderful moment. We allow the breath to guide us so we may flow with our inner energy. By training the mind to both focus on the breath and the physical alignment brings about a very clear, calm , blissful mind, and allows for a resolution. Practicing in this way learning to follow the different sensations of the body and the breath cultivates an attitude of compassionate self acceptance! 2.Attuning to Prana: there is an intelligent life force in all of us called prana. Prana is life force energy which guides the functioning of both body and mind. Through persistent practice you will become aware of the presence and flow of your prana. Sensing your prana can be used in two ways. You can dance with your prana flowing from one pose to another. You can hold a pose for a longer time as you focus on the sensations, emotions and thoughts that arise. Or you can do a combination of both. This teaches you to listen inwardly so you may be guided and prompted from within. This ability to one pointedly focus on the body, mind, and energy will begin to spread through all aspects of your life. This is a very exciting part of your yoga practice. It gives you a deep peace and inner knowing that you are more than this body and mind. You feel more centered and more clear. 3.Genuine happiness and deep peace: As you continue to deepen your practice, the ability of the mind to witness the movement and quality of the life force energy (prana) grows stronger. You will learn to surrender to this energy and allow it to guide you. The essential mystical truth is realized, spirit dwells within us! We learn that to be present and aware of our breath, body, and mind in the present moment is a fabulous thing that cultivates a genuine happiness and deep peace. You can tape into this state of peace while sitting in stillness, performing yoga asanas, or in your daily activities. This deep peace allow you to celebrate life more fully with a sense of playfulness. "Yoga is the practice of radical transformation" -George Feuerstein. •Feel: stay present to the different sensations (physical, mental and emotional) flowing through you as a way to stay connected to this magical moment. 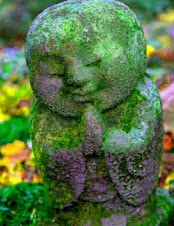 •Watch: observe your experience with compassion, neither grasping what is pleasant nor avoiding what is painful. •Allow: accept yourself and your experience exactly as it is, dropping the need to change it in any way. Allow for a revolution an awakening! •Celebrate: the beauty and truthfulness of life. No matter what your age, race, gender or religion, the benefits of living yoga are available to everyone.